7869 Battle for Geonosis is a Star Wars: The Clone Wars set released in January of 2011. It contains 331 pieces. The set includes a Proton Cannon, BARC Speeder and five minifigures; Luminara Unduli, Captain Rex, two Battle Droids, and a Super Battle Droid. The set is intended for ages 8–14. The Proton Cannon has many features such as posable legs that move side to side, up and down and a missile launcher for more realistic play. It has space for one pilot. The BARC Speeder is of the same design as the one included with 7913 Clone Trooper Battle Pack except the Green border line of the Speeder is replaced with a Dark Red colour. Out of the five Minifigures included, one is exclusive, one of them has appeared in only one other standard-release set, another one one of them has appeared in only one other standard-release set and the other two are common. Luminara Unduli makes her second appearance to date, but this time dressed in the Clone Wars style. Captain Rex makes his second appearance (excluding Comic-Con Exclusive Clone Wars Set) to date who features no changes to the original design from when he appeared in 7675 AT-TE Walker back in 2008. The other Minifigures include two standard Battle Droids and one Super Battle Droid which has made it's second appearance to date that features the Missile Launcher Arm that first appeared in 8018 Armoured Assault Tank (AAT). This set is based off of the Star Wars: The Clone Wars episodes "Landing at Point Rain" (Proton Cannon and Rex), "Weapons Factory" (Battle Droids and Super Battle Droid) and "Legacy Of Terror" (Luminara and BARC Speeder). 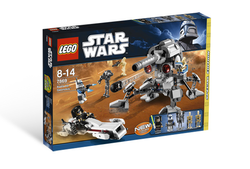 The set is also included in the set 66377 Star Wars Super Pack. Luminara Unduli has not been released in a set since 2005 in the 7260 Wookiee Catamaran. This is the second set to include a Super Battle Droid with a Missile Launcher Arm, the other being the 8018 Armoured Assault Tank (AAT) from 2009 which included 3. This is also the second set released to the public that includes a Captain Rex minifigure. The set contains the same type BARC speeder as the one from 7913 Clone Trooper Battle Pack except in red/maroon and white. The set includes a spring loaded cannon. 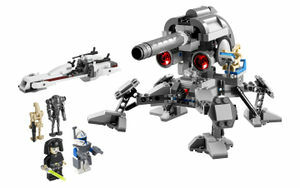 This set uses a different design to the Proton Cannon that appears in LEGO Star Wars III: The Clone Wars. This is a description taken from LEGO.com. Please do not modify it. (visit this item's product page) Help Captain Rex™ and Luminara Unduli™ fight the droid army! The Battle for Geonosis rages on! The devastating Separatist proton cannon leads the droid army in the greatest battle of Star Wars: The Clone Wars, with a missile launcher, adjustable turret and poseable legs. The Separatists seem unstoppable until Captain Rex and Jedi General Luminara Unduli arrive on the BARC speeder and turn the tide! Fire missiles at the opposition! Facts about "7869 Battle for Geonosis"
Help Captain Rex™ and Luminara Unduli™ fight the droid army! This page was last edited on 18 August 2017, at 00:54.